I can’t believe how fast the fall semester has flown by! As the year comes to a close, I want to thank all of you for your dedication in making Florida State University a great place to learn and work. We accomplished a lot in 2015, and I outlined several of these achievements in my recent State of the University Address. It was wonderful to see so many of you on hand, but if you missed it, the speech is posted online here. I’m especially pleased about the appointment last month of Dr. Sally McRorie as our new provost. I’d like to thank you for the very active and important role the faculty played in the provost search. I know we’ve made the right choice. Sally’s passion for Florida State runs deep, and she will do an outstanding job in helping to elevate the university to national prominence. I’d also like to extend a thank you to Dean Sam Huckaba and those serving on the recently announced search committee for a new dean of the College of Law. Dean David Rasmussen and the search committee for the new dean of the College of Business are also making great progress. I know they will find leaders who will build on the colleges’ reputations as some of the best in the nation. Providing the best student experience possible is integral to our academic mission and the success of our students also can help raise FSU's national profile. I know you are working with students to engage them in research and creative endeavors. So many of you go beyond the call of duty when it comes to your students. 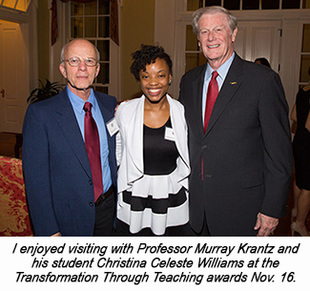 Several faculty members were recognized recently at the Transformation Through Teaching awards event I hosted at the President’s House in November. While I was listening to students share the inspirational stories about how the award-winning professors had touched their lives, I was reminded of the responsibility we hold in not only developing students intellectually but helping them realize their dreams outside of the classroom. I commend your devotion in this effort, and I meet students every day who are the beneficiaries of your energy. Just last week, we recognized some of FSU's most well-rounded undergraduate students at the Garnet and Gold Scholar Society induction ceremony. It is exciting to know these students will graduate this weekend and go out into the world looking to make a difference. Seeing the smiling faces of thousands of graduates — and their parents — at commencement is an obvious way I know we are doing our collective job. We are preparing career-ready college graduates who are also good citizens. We should all take pride in that. I’m happy to once again share a few news clips below. 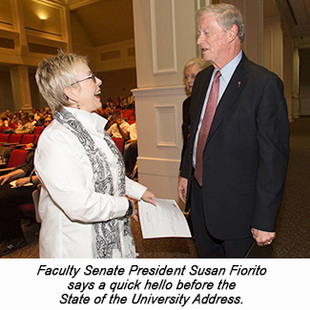 Our entire faculty is doing a great job generating positive media attention for FSU. Keep up the good work! Please continue to share your ideas and feedback with me. I truly enjoy hearing from you and the news from your corner of campus. Our accomplishments over the past year have laid the foundation for what I think will be a truly transformational year ahead, and I’m excited to get started! Have a safe and relaxing winter break! I look forward to seeing you in 2016.